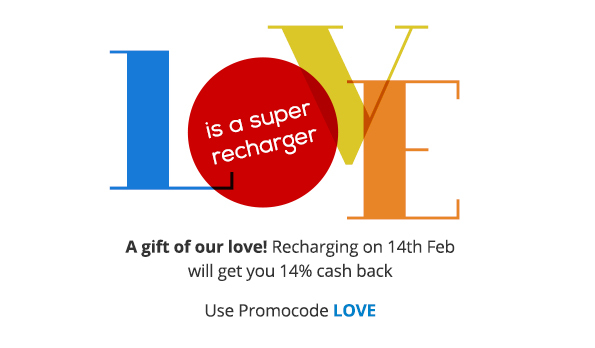 Mobile And DTH Recharge 14% Cashback On Rs.300 – PayTm Offer. Will be valid only for one day, 14th Feb, 2014 from 9:00 am to midnight. The promocode can be used only once per user. Offer is subject to a minimum recharge value of Rs. 300. Maximum cash back value is Rs. 100. User has to be signed in to his/her Paytm account to avail this offer. To avail the cash back, user needs to have verified his mobile number, if not done already. Paytm was incubated in One97 with a rather simple, singular pursuit: To offer a simple, fast and enjoyable experience for online recharges and payments. Over the months we’ve earned the trust of over 3.5 million Indians. We feel humbled.